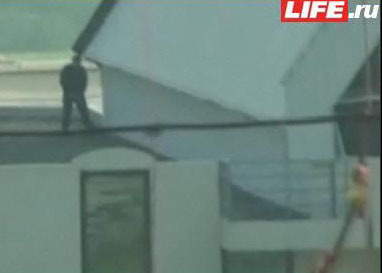 While Bush’s visit to Sochi was pretty boring (Sochi’s all about pleasure, not business, you should know it by now :)), Life.ru brings us a wonderful story – with video – from the roof of Sochi’s airport. Literally. American presidential security boys have arrived a day early and settled in around Sochi’s airport to ensure safe landing of their president. When the time came, while Air Force One was on its way down, one US sniper, located on the airport’s roof, “took it out” and emptied his bladder. Here’s a photo, and you can watch the video on this life.ru page. Air Force One has landed today in Adler airport, marking the beginning US President’s first visit to Sochi on his two days work trip. 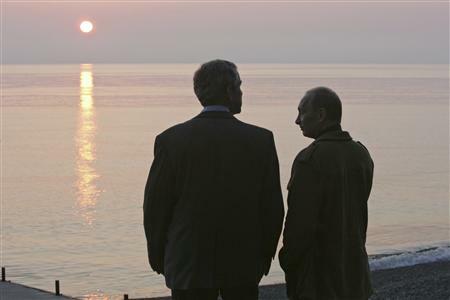 It will most likely be the last time George W. Bush and his Russian counterpart Vladimir Putin will meet as presidents, as Putin’s second presidential term will end in May. There was no official word on what will be discussed during the meeting, but there sure are a lot of issues to be discussed between the US and Russia. Like Kosovo, anti-missile defense (many believe this one will be the main topic), NATO expansion, the Russian-U.S. relations and many other. «The Times» reports that Putin will officially propose the tunnel between Alaska and Russia’s Far East. And Russian media reports about possibility of signing a “strategic framework” document — sort of “road map” of the Russia-US relations, the guide for Next Russian and US Presidents (the next Russian President will take office in May and the presidential elections in the USA will take place in the end of this year). The US delegation has 700 people, including US Secretary of State Condoleezza Rice, National Security Advisor Stephen Hadley, and US Ambassador to Russia William Burns. Russian delegation will include all their counterparts, and president-elect Dmitry Medvedev. The first day is over now and there was no official “business” talks, it was all about pleasure: Putin gave tour to George and Laura Bush of future Olympic areas, presented scale models of Olympic projects, sea shore walk and sunset watch (how romantic *rolling eyes*), fancy dinner with a concert in presidential residence “Bocharov Ruchei”.